SANTA ANA, Calif. – (November 29, 2013) – On Thursday, November 28, 2013 at approximately 1:38 p.m., Inmate Itzcoatl Ocampo (3-20-88) was pronounced deceased by medical staff at Western Medical Center (WMC), Santa Ana. Ocampo was being treated in the Intensive Care Unit (ICU) after becoming ill while in custody at the Orange County Jail (Central Jail Complex – Central Men’s Jail). On Wednesday, November 27, 2013 at approximately 6:35 p.m., Inmate Ocampo was transported by Orange County Fire Authority paramedics to WMC, Santa Ana after he was discovered ill by deputies in his single-man cell at the Central Men’s Jail. Deputies discovered Ocampo shaking and vomiting in his cell and immediately summoned medical attention. Ocampo was treated and transported to WMC, Santa Ana where he remained until his death. Ocampo was in custody on charges of CPC 187 – Murder. He is accused of committing multiple murders along the Santa Ana Riverbed and in the cities of Yorba Linda, Placentia and Anaheim. 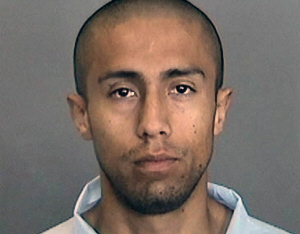 Ocampo was arrested on January 13, 2012 following the efforts of a multi-agency task force. He was being held without bail and scheduled to be in court on January 17, 2014. Ocampo’s death is being investigated by the Orange County District Attorney’s Office as is protocol for all Orange County Jail in-custody deaths. Ocampo’s autopsy is tentatively scheduled for early next week and toxicology results will not be available for several weeks. All further inquiries regarding the investigation should be directed to the Orange County District Attorney’s Office.